The Tricycle Foundation is dedicated to making Buddhist views, values, and practices broadly available. In 1991 the Foundation launched Tricycle: The Buddhist Review, the first magazine intended to present Buddhist perspectives to a Western readership. Tricycle soon became the leading journal of Buddhism in the West, where it continues to be the most inclusive and widely read vehicle for the dissemination of Buddhist perspectives. Look at these words: the most inclusive. I am aghast that they can shamelessly make such claims when it turns out that Tricycle continues to devote, on average, less than 9 percent of its bylines to authors of Asian heritage. In a community where at least half of the members are Asian American, this exclusion is obscene. I wonder what they could have possibly meant by calling themselves “inclusive”  I can only imagine that these words are intended as a subtle dig against Shambhala Sun. Following a suggestion, I went through the last 15 issues online and counted up the bylines. (Beyond Winter 2005, I started finding online articles with omitted bylines.) You can see the results in the image to the right. 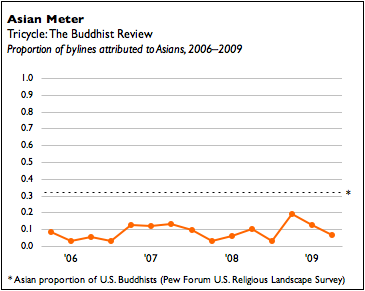 At least over the past four years, Tricycle has continually declined to welcome Asian American Buddhists into its ranks, with the exception of the occasional token minorities. Someday, I'll just sit down with a stack of all the issues back to 1991, and then I'll have some real fun. One thing that's occurred to me is that I would like to make a difference. My writing is about as influential as Free Burma activists trying to take on the Burmese junta. So how can we get Tricycle to represent? I know a few of the contributors to Tricycle, and there are a few more contributors who keep an eye on my blog. If they truly care about Asian American voices, then maybe the next time they have an opportunity to write a piece for Tricycle, they might ask the publisher whether any consideration had been given towards extending more opportunity to Asian Americans. And don't forget other minorities too! Would anyone care? I'll ask around.